It's the largest pond area of Catalonia. 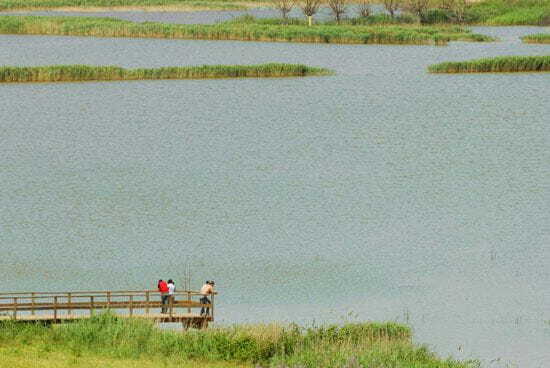 Ivars and Vila-sana’s lake, which has been recovered since 2005, has a surface area of 126 ha. It is the biggest lake in the inner region of Catalonia in terms of dimension. It contains a wide and important biological variety. Nowadays it is a fresh watered lake although it comes from an endorheic origin. The water of this lake area comes from the Urgell canal. It takes the same amount of water that was used to irrigate the fields that were placed where the lake is situated nowadays. The water drains into a Corb’s river tributary. The depth is very low in its perimeter (< 1m) so the lacustrine communities are able to proliferate. The maximal depth is lower than four meters and the average is less than 2m. Some islands were created all along the lake. The islands are different shaped, with slopes, heights, and places that favour the fauna, especially birds. There are several resting, feeding and reproduction spots.